Weddings are really expensive. Stupid Expensive. Trust me, I know, le sigh. Even with a good budget it’s easy to see it spin out of control with unanticipated costs. When it comes to staying on a wedding budget, there are plenty of financial traps, hidden fees and add-ons that crop up along the way that don’t get factored into an initial estimates. Since I’ve been planning our nuptials for June of next year, we know firsthand sticking to a wedding budget can sometimes be downright stressful. Each year, the Knot conducts a survey to see how much couples are shelling out for their weddings. Last year, couples admitted to spending, on average, $28,858, and it seems to grow each year. Gross. Honestly though- it doesn’t matter what you spend, any budget can easily become inflated when those nasty little “extras” start cropping up! Many wedding experts and budget savvy brides suggest building in about 20% of your budget to cover unexpected costs. While nobody wants to build in 20% of their overall budget to cover unanticipated costs, it could save you in the long run. Sure, it’s not as fun as picking cake or debating satin between or taffeta, but chances are, speaking from experience- everything costs more than you bargained for! While we all wish that the dress fit perfectly off the rack- usually, it doesn’t. Also, due to the popularity of strapless gowns and backless dresses, making sure your dream dress fits like a glove is absolutely key… problem is, alterations for bridal gowns can add up to about half of the cost of your dress, especially if your weight fluctuates due to stress, exercise or life changes. Sweatin’ for that dress? It’s better to sweat FOR the dress than ABOUT the dress- factor alterations costs into your budget. Additionally, in my experience- despite the fact that bridal salons tell you that your dress is “custom,” most likely it is not being made for your unique measurements. Most dresses can require $400+ in alterations, and it’s easy to forget to factor this into the cost of your dress. Sure, you don’t need it but you really think it would be special. This is where things get out of control- someone is helping you out or saving you money, or they’re just awesome and you love them…so, gifts. We’re talking gifts for parents, groomsmen, bridesmaids, flower girls, ring bearers, place setting favors, welcome bags… who knows what else. Plan ahead for these costs or save money with DIY or low-cost gifts that still have a big impact (like framed photos or something edible for guests you make at home). One things most brides don’t realize that is while they know hair and makeup will be important on the big day, there are things called “trial runs,” for hair and makeup and they get pricey. In general, you will pay more for a wedding up-do due to the fact you’ll most likely need the stylist to do a “trial run,” and then, replicate that look on the big day- so you won’t be paying your normal $45 for an up-do. Salons can charge up to $150 for brides. If you’re doing any other parties (as mentioned above) you may still be yearning to get a nice tan, your nails done or treat yo’self to something fancy at the spa before you take engagement photos or really go all out for your bachelorette. If you’re nice, you may treat other people to something fancy too- like your mom or mom-type figure, who really deserves a pedi once in awhile! Salon treatments can seem harmless, but easily add $300-600 on your budget depending on your location and services. Yes, you read that right- some venues require an on-site babysitter if you have children in attendance. I kid you not. Be sure to ask before you book and really read over those costs. Valet is also a “must” at some venues, even if you’ve told them several times you’re renting a party bus from the hotel- if this is non-negotiable, be sure to decide upon transportation before you book. Even if you’ve decided to BYOB to some venues, there are corkage fees and setup fees for the service and of course, staffing concerns. Some venues have “partner vendors” they will only work with that seem to come with an array of pesky fees and mandatory add-ons as well. Before you book a venue, make sure you know what your options are for hired help. Also- one last piece of advice: get good at math. If a vendor charges “per person” make sure that doesn’t mean to serve as well. If you go to your own bakery, your venue still may require you to pay a service fee to get the cake ready and put it out for guests…by the person. Suddenly, that free cake Aunt Jane made costs $1.50 x 150 people to serve and retrieve the plates. How are you (or your guests) getting from the airport, to the hotel, to the venue? Are there valet fees? If you hire a limo or a party bus, be sure to examine those hidden costs. It’s up to you if you want to factor in airfare, taxis or hotel stays for your and your groom that surround your big day, but easily, lodging alone can add $300 to your budget for the two of you. In terms of the “stuff” you’ll need, like food, beverage and flowers- they apparently don’t show up for free either! Additionally, even if you do a picnic style wedding- what are the delivery and setup fees for your food, flowers and necessary furniture? Do you need to tip every person that delivers even a cake stand or will your service provider bake that into the price of your bid? Ugh- nothing is certain aside from death and taxes… hopefully only one of those will happen on your wedding day. You will pay tax on food, services, booze and the venue. You’ll pay taxes on your dress, your gifts, and your flowers. Taxes, taxes, taxes. Seriously, when you calculate your budget, factor in those stupid taxes and you’ll thank yourself later. Everything has a tax. You will be paying tips for services from the day you get engaged until you drive off with cans rolling behind your car. Anytime someone does something for you- from your hair & nails to the folks setting up the chairs at your ceremony site, tips are appreciated and expected. Mandatory gratuities at venues range from 18% to 20%. Generally, you’ll also need to factor in tips for everyone: the ceremony officiant, wedding delivery or set up staff, hair stylists or facialists, valet attendants, bands or DJs, and anyone that does anything requiring labor. Also- see if someone in your wedding party will be in charge of dolling out the cash during your day-of, or if you can pay these things in advance with your vendor. Newly married, tipsy in love couples shouldn’t be worried about tipping the waitstaff on their big day! Super helpful resource: The Knot’s wedding vendor tip cheat sheet. We’re about 8 months away from our wedding and so far, we’ve been on an even course to get our budget on track, but it’s infuriating to see these little expenses crop up as we go along. Luckily for me, the dress has fit (I’ll have a post on that soon) and we’re still working on figuring out how much the salons and flower stuff will cost, but hopefully we have budgeted in for most of the surprise costs along the way… but we know a few will sneak up on us like stupid ninjas in the night…. stay tuned! 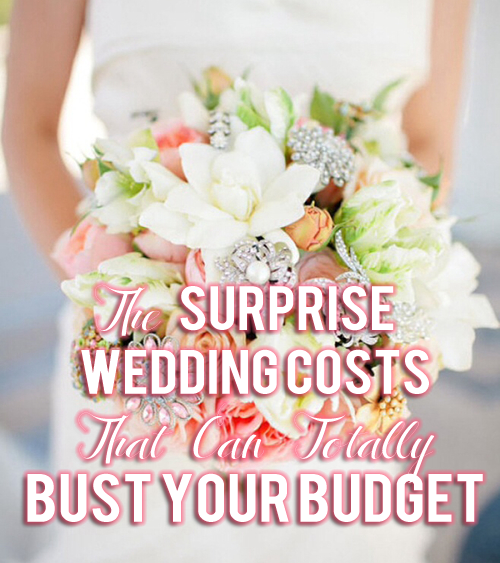 What are the worst bridal budget-busters you’ve encountered? 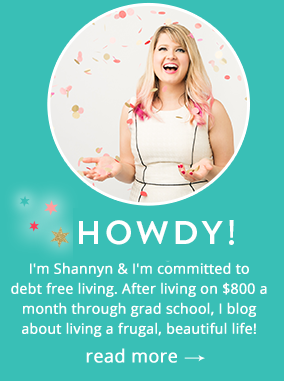 Any tips for a bride on a budget to save some money? some venues also make you buy dinner for their staff- so, you budget for 100 guests, but end up paying for 120+ plates because everyone serving/working eats on your dime. I hate to be a brat, but I’ve never had my JOB buy my meal like that. even as a volunteer at gala-style events, we got a brown bag, not the fancy pants dinner the guests ate. Shocking amount of money to pay. A friend of mine spent almost £40,000. On one day. ONE FREAKING DAY! To me, that’s taking a year off work, unpaid, to travel with your lovely new spouse. I can’t even imagine. My husband and I got married at City Chambers, invited 10 people, went for lunch at nice restuarant and then jumped on a train for a dirty weekend of a honeymoon, in our complete (cough) finery. Our whole day cost us less than £1,000, including flowers and admin fee’s at the registry office. I haven’t felt any lack of it. God knows we’d still be feeling it now, 12 months on, if we had a big huge debt to pay off. A debt incurred so all our cousins and aunts and uncles who we don’t see from one decade to the next can eat and drink. No thanks! Yes, there are so many hidden expenses with wedding planning. I’m glad you’ve covered most all of them. I’ve never heard of buying dinner for the venue’s staff – that’s ridiculous! One thing that was missed in your list are meals for your vendors (i.e. photographer, videographer, band/DJ, wedding planner, etc.) I had only originally factored in the photographer but since my vendor list has grown, so have my vendor meals!! But believe me, you’ll have much happier vendors throughout the night if they’re fed. Otherwise, great list! Good to know! We are so behind on the wedding planning, and I’m starting to stress out! Thanks for the budget tips!